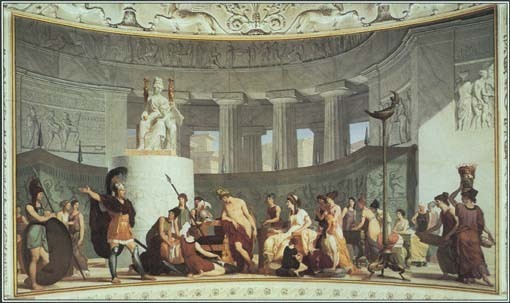 Paris played a minor role in the Trojan War. As a warrior he was less skilled than his brother Hector, and his cowardly nature won him little respect. This painting shows Hector forcing Paris to fight a battle. See also Achilles ; Agamemnon ; Ajax ; Andromache ; Greek Mythology ; Hector ; Helen of Troy ; Homer ; Menelaus ; Odysseus ; Odyssey, the ; Paris ; Priam ; Thetis ; Trojan War . The grammar in the article is horrendous. I've been using this website for a Greek mythology project, but this entry needs some work.